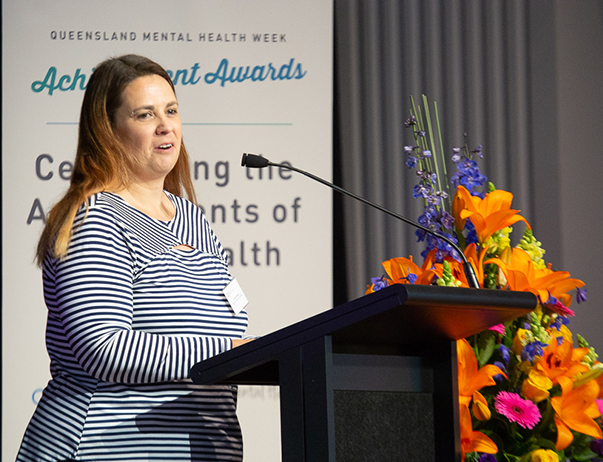 It’s your time to shine, congratulations to the winners for the 2018 Queensland Mental Health Week Achievement Awards! 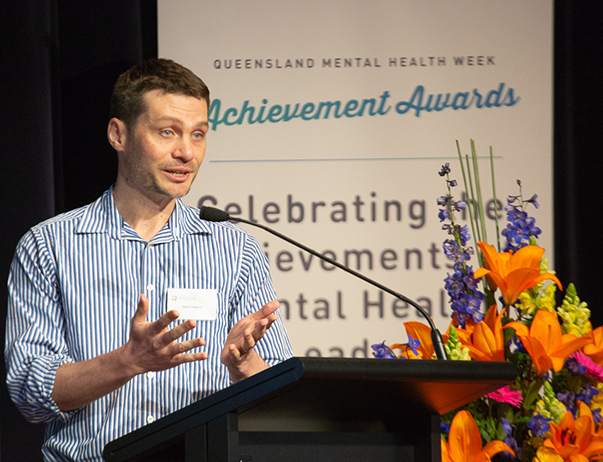 Open Minds is delighted to congratulate our 11 Queensland Mental Health Week Achievement Awards winners, announced on Friday 12th October 2018 at the Awards Breakfast and Presentation Ceremony at Brisbane City Hall. Amongst the winners were Peach Tree Perinatal Wellness, who provide mental health support for new parents, who scooped multiple wins in two different categories. As well as Justin Chapman who won both the Individual category for his personal work and his work at QIMR Berghofer, Metro South Health and PCYC Queensland, in addition to the Not-For-Profit Large category for PCYC's ‘Healthy Bodies, Heath Minds’ exercise program for which he is the program manager. Bremer State High School and Queensland Ambulance Services were both repeat winners and were successful two consecutive years in a row. Justin Chapman won both the Individual Award and accepted the Not-for-Profit (Medium to Large 101+ staff) award for PCYC Healthy Bodies, Healthy Minds program. Justin began working as a peer-support worker in 2011, where he developed and implemented peer-support and exercise programs for people with mental illness. With a focus on the benefits of exercise for individuals recovering from poor mental health concerns, Justin developed Lifestyle Intervention Program ‘Healthy Bodies, Healthy Minds’. This program has been embraced by mental health organisations across Brisbane. PCYC’s Healthy Bodies Healthy Minds (HBHM) is an exercise and nutrition program for people living with, or recovering from, mental illness. It addresses the health disparity experienced by people with mental illness, through the provision of community-based lifestyle interventions delivered by exercise physiologists and dietitians. The program received funding in 2015 and has since expanded to state-wide operation implementation. Peach Tree Perinatal Wellness provides peer-led support for parents during pregnancy and early parenthood. For the past 12 months, Peach Tree has been running a free 6-week program, the Sunshine Parenting Program (SPP), building resilience for mothers with babies under 12-months of age experiencing mild postnatal mental health challenges. To-date, results from mothers have indicated improvements in postnatal mental health symptoms, in addition to feedback highlighting themes of improved connectedness, feelings of social inclusion, and normalisation of postnatal experiences. Peach Tree peer workers hold sensitively the often chaotic and broken space shared with them by mothers in desperate need of empathy and non-judgemental understanding. Families find in Peach Tree a deeply compassionate support service where the team have experienced similar hardships, uncertainty, and heartache – providing a warm ray of sunshine for families to hold. Madison Birtchnell won the Youth Award category. Madison’s mission is to make genuine and tangible change in mental health, social justice and humanitarian issues. Her belief is that every person should be valued, respected, included - that we should always show another person kindness and understanding. Madison has enacted change at grassroots level through education, creating awareness and positive social change. For 11+years she has worked tirelessly to reduce stigma, whilst providing support and empowering those living with mental illness. 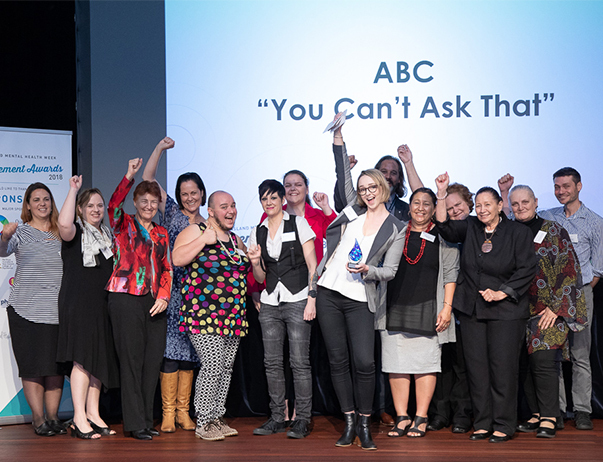 ABC – “You Can’t Ask That” won the Media Award category as well as the overarching Earle Duus Award. ABC – “You Can’t Ask That” is a series that focuses on misunderstood and marginalised Australians, allowing interviewees to answer hard questions in their own words. Two ground-breaking episodes from series 3, feature the first-person voices of Australians living with Schizophrenia and Eating Disorders. The episodes aim to empower and celebrate their experiences and to break down stigma, reduce inequality and discrimination, and increase understanding of mental health. 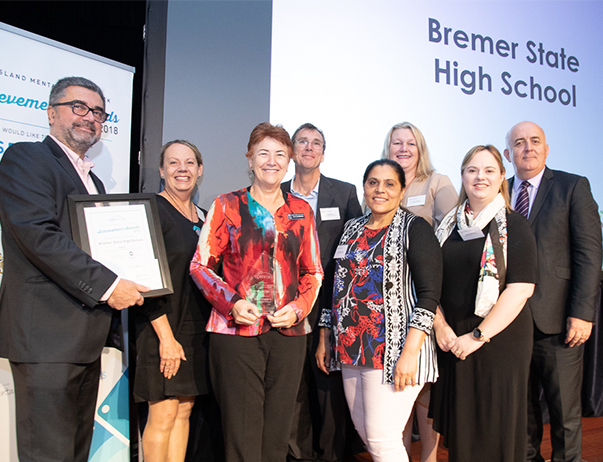 Bremer State High School, winner from the 2018 Workplace SME category, is once again a finalist for recognition of excellent practices being delivered school-wide in mental health and wellbeing. During 2018, a new building has been created for students and support staff to access the range of services offered. Bremer SHS has provided a number of new programs and initiatives during 2018 for both staff and students, to ensure that mental health and wellbeing remains an important focus. Queensland Ambulance Service - Priority One won the Workplace Award Large (201+ staff) for a second year running. 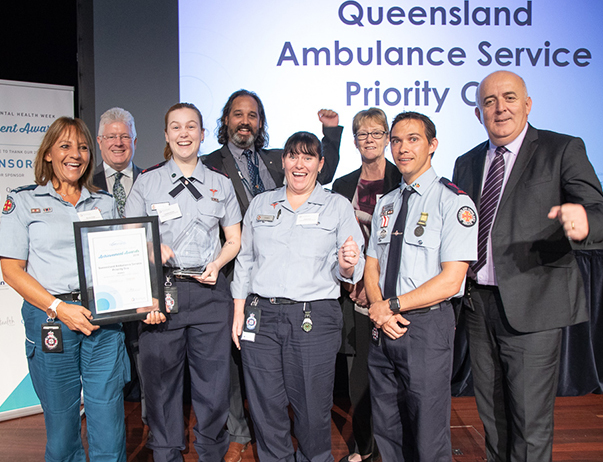 Winner from the 2018 overarching Earle Duus Award, the Queensland Ambulance Service has a Staff Support Program known as Priority One. This program has been in place for over 25 years and is recognised and accessed by personnel and their families. The program promotes and protects the psychological wellbeing of personnel. This year the program team developed the QAS Mental Health and Wellbeing Strategy 2018-2023 to strategically focus on future direction to mitigate psychological risks. 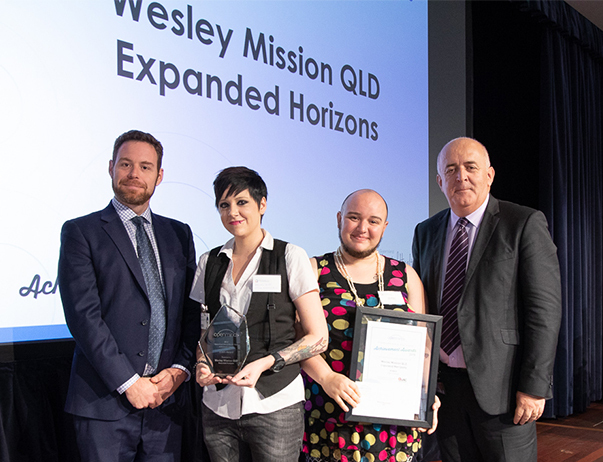 Wesley Mission QLD - Expanded Horizons won the LGBTI Award. The Expanded Horizons Program provides group and 1:1 support for LGBTIQAP+ youth (or youth questioning sexuality or gender identity). The program offers: QSPACE – for young people (12-17 years) and QPLUS - for youth (18-25 years) with both groups providing resources, guest speakers, peer support and information to enhance pride in identity and buffer against issues of discrimination and homophobia/ transphobia. The programs support young people to access information regarding topics of interest, mental health, sexual health, and support networks. 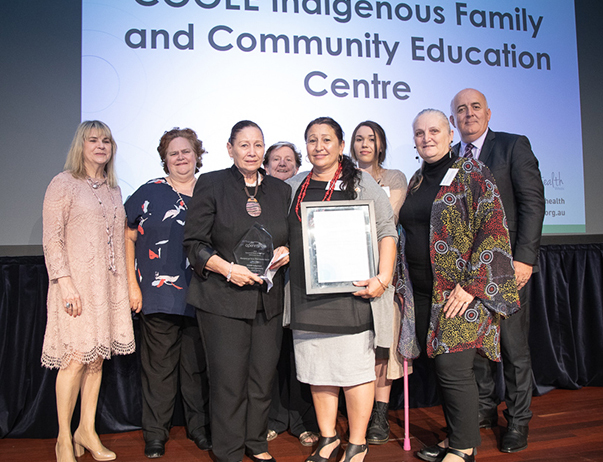 COOEE Indigenous Family and Community Education Centre won the Aboriginal and Torres Strait Islander Award. COOEE Indigenous Family and Community Education Centre provides cultural education and well-being for Aboriginal and Torres Strait Islander people through educating the local and wider community. The Centre is focused on enhancing the quality of life and well-being of Aboriginal and Torres Strait Islander people who live with mental illness. The Elders and team at COOEE are passionate about making a difference to the lives of individuals and families in community. 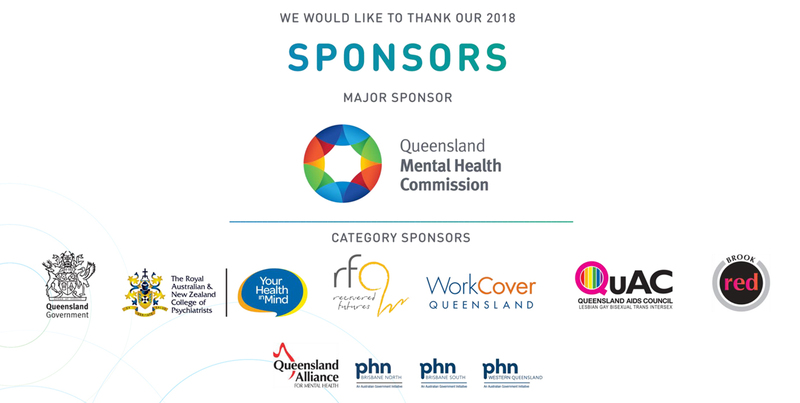 Our thanks again to our sponsors: Queensland Mental Health Commission, Royal Australian and New Zealand College of Psychiatrists (RANZCP); Queensland Alliance for Mental Health, Queensland Health, Brook Red, QuAc, RFQ, WorkCover QLD, the phn Brisbane North, the phn Brisbane South, and the phn Western Queensland. 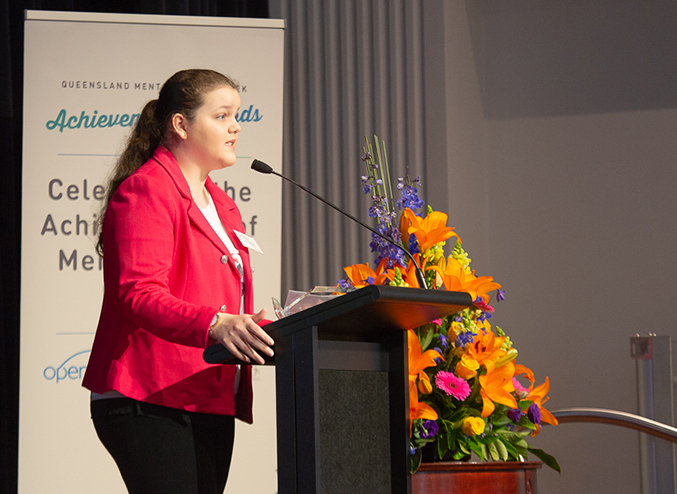 With the 2018 Queensland Mental Health Week Achievement Awards nearly upon us, and the nominations pouring in, here's a refresh of our winners and finalists from 2017! It’s their time to shine! Congratulations to the 30 finalists for the 2018 Queensland Mental Health Week Achievement Awards.